DoceboInspire Learning Awards honours the best in learning and development. Docebo has profiled two previous nominees and winners to highlight what helped to make them successful. The world of learning is constantly evolving. Docebo has consistently been on the precipice of that change, making sure our technology helps our customers develop innovative learning solutions. DoceboInspire celebrates the innovative strategies being developed and deployed by our customers, and an entire evening is dedicated to showcasing their achievements and learning from their successes. In honour of this year’s DoceboInspire Learning Awards nominees, Docebo has profiled two previous award winners to show you what has made them successful and give you a taste of what you can expect during their exciting sessions as speakers at this year’s conference. DoceboInspire is all about celebrating customer innovation and their learning programs and to provide a place where L&D professionals can share trade secrets, best practices, and learn what their colleagues are up to from around the world. 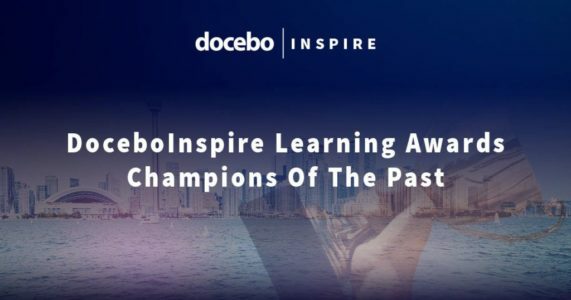 The celebration is perhaps most exemplified with the DoceboInspire Learning Awards, which is a chance to put the spotlight on customers for their learning and development success and innovation! This year, Docebo has recieved some truly inspired nominees from all over the world across many industries, including returning nominees from last year’s event. Both of the L&D pros profiled below also have their organizations in the running for awards this year. This year’s 2018 DoceboInspire is lucky to have previous winners from last year’s learning awards providing their insights on two illuminating topics. We want to celebrate and spotlight these two incredible L&D professionals who are two-year running nominees in various award categories and have plenty of knowledge to share during their panel discussions at this year’s event. Evan Beheil from Cineplex and Patrick Veenhoff from Swisscom both know what it means to implement social learning within their enterprise learning strategy and are evolving and pushing change in the learning industry. At this year’s conference, Docebo will be capping off day one (October 11) with a can’t miss panel with Patrick that’s all about “Training That Your Learners Will Line Up For.” You also won’t want to miss Evan’s insights during the session on “Social Learning: The way of the Future” on October 12. Both of these topics focus on some of the hottest conversation items in L&D today and are sure to leave attendees with actionable insights that they can take away and implement in their learning strategies back home. Evan Behiel is a veteran of the L&D industry with plenty of insight to provide, particularly on how to implement learning strategies that truly speak to his learners. As the Manager of Training and Development at Cineplex in Toronto, Ontario, Canada, Evan has spent the last two years leading instructional design and managing the LMS at Cineplex. During his time with the company, Cineplex has continued to make incremental improvements to its learning strategy, implementing it with Docebo as its learning platform. Last year, Evan and his team walked away winners at the first annual DoceboInspire Learning Awards, taking home the top honour in the Charles Jennings Award For Excellence in 70:20:10 category. The team at Cineplex identified a need for national consistency in their training programs and embarked on setting the stage for a game changing production. Following the 70:20:10 learning model, Evan and his team created a robust orientation training program that featured specific on-the-job training experiences, meaningful debrief conversations, e-learning modules, classroom training, and knowledge check-ins. The Cineplex learning experience moved the emphasis away from traditional formal classroom training modules to more meaningful and consistent experiences that simulate what their “cast members” see on-the-job. Feedback and preliminary results from their strategy consistently showed high levels of knowledge retention and understanding reflected in reports from the company’s ‘Guest Services’ department. This year, Evan and his team are nominated for the Best Use of Blended Learning. Prior to his role with Cineplex, Evan spent 8 years as a Training Consultant for Cineplex. In this role, Evan focused on facilitating and developing internal strength on various levels across Alberta, Saskatchewan and Manitoba. Evan was also the recipient of the internal prestigious Epic Award, an honor bestowed on a chosen Cineplex employee annually for demonstrating strong corporate values. With plenty of experience implementing engaging learning strategies, you’re definitely not going to want to miss his part in the panel discussion on the topic. Patrick and his team in Swisscom’s L&D department are a little different that what you might expect from a typical department in their industry because they don't actually produce any training content – nor do they have any trainers. Instead, Patrick and his team have empowered the company’s 5,500 employees to design, create, and deliver training materials themselves. The Learning & Development team then takes that content and creates curated blending learning paths within their Docebo platform for key roles, by combining internally produced training content with external training content. Patrick explained to us that, “learning experiences are engineered to deliver great user experiences to drive engagement via the Docebo platform.” Their ultimate goals are to enable the transformation to a learning organization, develop continuous learning behavior among their employees, and measurably contribute to achieving strategic business targets. As the head of Learning & Development at Swisscom, Patrick is a seasoned, results-driven and multilingual professional with a number of years designing and deploying training programs for enterprise organizations with upwards of 5,000 employees. Patrick’s expertise has had a profound impact on the performance of organizations on a global scale, as seen in his orchestration of the ENT Academy, where Patrick steered the project from conception to full operation in just six short months, despite strict deadlines and budgetary constraints. You won’t want to miss his part in the panel discussion on October 11th and be sure to congratulate him on his team’s two 2018 Learning Award Nominations. Patrick and his team are nominated this year for both the Best Employee Training Program, and the award that Evan’s team won last year, The Charles Jennings Award for Excellence in 70:20:10. DoceboInspire is less than a month away – you don’t want to miss these two incredible L&D Professionals and learn from their wealth of experience. We have an incredibly packed two days of inspiring speakers, fascinating panel discussions and can’t-miss keynotes. Head over to the DoceboInspire Learning Awards page and see the full list of nominees and while you're there, grab your ticket for this year’s event! This year’s 2018 DoceboInspire is lucky to have previous winners from last year’s learning awards providing their insights on two illuminating topics. We want to celebrate and spotlight these two incredible L&D professionals!